Trying to research myself, I believe that is a calligraphic poem on one side but haven't found much else to compare. The height is 45.5 mm & diameter is 20.5 mm. Additional photos are included in link. Any assistance with determining if authentic & possible value would be much appreciated. Your Chinese porcelain baluster jar with famille rose decoration of women in a garden setting has an inscription on its side that ends in a short line saying, "Produced by Rong Ji in Jiangxi (Jiang xi rong ji sheng - 江西榮記生). 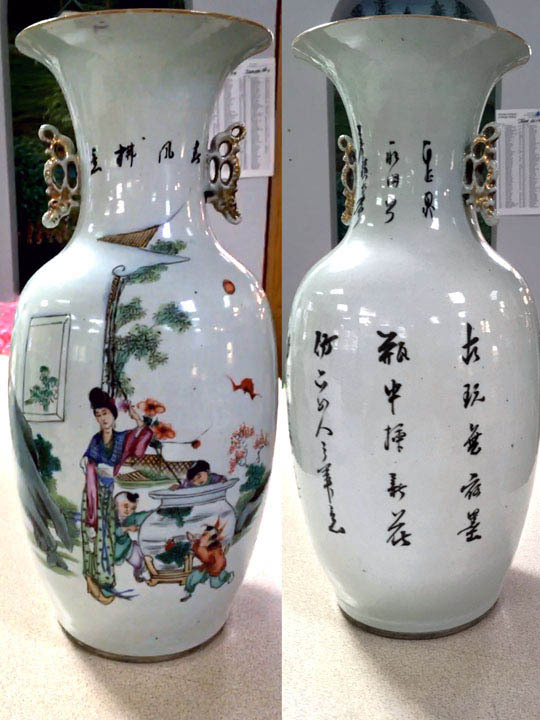 I've pasted links below to a couple of vases found under discussion in Mainland China forums, the first one, from a 2011 thread, concerned a mirror-image of yours, with a nearly identical inscription. The other, a cylinder vase with different decoration, had an inscription ending with "Product of Rong Ji in Jiangxi", rendered as "Jiang xi rong ji chu pin - 江西榮記出品. The vase like yours also had a similar label attached, with a comment at the end of the photos saying it had been sold to foreigners in the 70s-80s by the Friendship store in Beijing. Its dimensions were given as height of 43 cm and diameter of 21 cm. "It is difficult to say nowadays if there was extensive imitation of late Qing porcelains circa the Liberation era or of imitation Republic blue & white and famille rose porcelains circa the Liberation era. It neither matches my idea of popular ware, nor can I locate this ‘Jiangxi Rong’, Can you find it? It can be taken for granted, unless the fault lies with the use of a transfer decoration, ‘Jiangxi Rongji’ would have been a legitimate Republic of China to Liberation Era marking. These markings can be said to resemble retail store logos, and since there are so many of these slogans, one might be difficult to search for. This answer is recommended by friends"
In my opinion, your vase and the ones cited above from online forums have the form and decoration characteristic of what were being produced in the waning years of the Republic of China and the Liberation era, which generally covers 1949 and into the decade of the 50s, when the Chinese economy was being restructured along communist lines. I've also had some hands-on experience with some differently decorated vases of the same form, size and circa mid-20th century period that were sold by another Friendship Store during the 1970s-80s for a price way beyond what they were worth in the USA at that time. However, the auction prices seem to have caught up nowadays. I'm uploading images of another vase of the same form with different inscription that was sold in an estate sale a couple of years ago to a dealer I know. He had sent me some pictures for an opinion on age but not showing any possible markings of the maker. I'll have to check later and see if has anything relevant. First, thank you Bill H ! The Chinese mainland forum information (translated) answers my question on time period & it's origins. Concerning the vase purchased at the estate sale, would you happen to recall the approx price the seller paid ? Thanks for taking the time to share your knowledge ! I didn't attend the sale myself but know the dealer who bought it. Next time I see him I'll ask if he knows.